High Representative of the EU for Foreign Affairs and Security Policy Federica Mogherini expressed regret on Tuesday over US decision to pull out of the Iran nuclear deal saying the European Union is to comply with the full implementation of the deal. 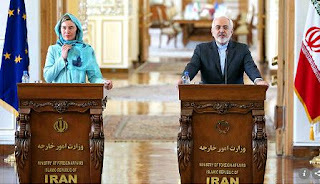 “As we have always said, the nuclear deal is not a bilateral agreement and it is not in the hands of any single country to terminate it unilaterally,” Mogherini added. “It has been unanimously endorsed by UN Security Council Resolution 2231. It is a key element of the global nuclear non-proliferation architecture, it is relevant in itself, but even more so in these times of encouraging signals on the perspective of the denuclearisation of the Korean Peninsula,” the EU's top diplomat said. Iranian President Hassan Rouhani said Tehran is ready to resume its nuclear work after holding talks with European, Russian and Chinese parties to the 2015 deal, and asserted that the country will remain in the deal despite Washington's withdrawal. Speaking live on Iranian state television immediately after the U.S.' announcement, Rouhani called Trump's decision to pull out of the nuclear deal an act of "psychological warfare" against Tehran. He also said there is a "short time" to negotiate with the countries remaining in the nuclear deal, and warned his country could start enriching uranium more than ever in the coming weeks. "I have ordered Iran's atomic organization that whenever it is needed, we will start enriching uranium more than before," adding that Iran would start this "in the next weeks," he said. He also said he will be sending Foreign Minister Mohammad Javad Zarif to countries remaining in the accord.